Oklahoma, 1934 Amidst the fear and uncertainty of the Dust Bowl, Catherine longs for the immortality promised by a professor at a traveling show called The Electric. But as her family’s situation becomes more dire -- and the suffocating dust threatens her sister’s life -- Catherine must find the courage to sacrifice everything she loves in order to save the one person she loves most. I was super excited to get started on Midnight at the Electric by Jodi Lynn Anderson! The summary for the book sounded really interesting, and I love the cover as well. I’ve only read one other book of Jodi’s in the past, that being Tiger Lily, and I was definitely curious to read more. 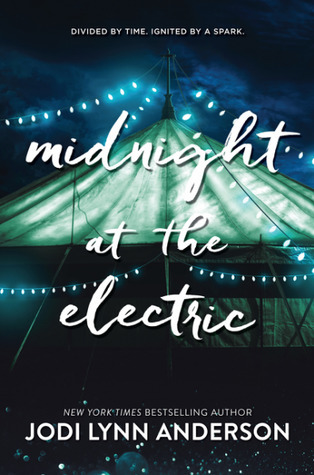 The story of Midnight at the Electric is told by three different narrators, and I was completely fascinated by all of their stories. Adri’s story is told from the year 2065, and I really enjoyed the futuristic aspects of it, and the messages that it sends. Catherine’s story is told from 1934, and probably held me the most captive of all throughout the book. And then there’s Lenore’s story, told from 1919, which was pretty awesome to read as well. I really loved all of these ladies, and their stories, and how they entwine with each other, were completely fascinating to read about. This book was a really quick read, coming in a less than 300 pages, and I read it just a few hours time. The storyline for the book was interesting, and I really enjoyed how the characters stories played out and entwined with each other. I was definitely fascinated with that. I’m not sure I really got the sci-fi parts of the story, especially the part about the Electric, which I expected to have a much bigger part in the story, but didn’t. I feel like the book would have been great even without those elements added. I was, however, completely fascinated by the parts about living on Mars, and would totally read a story just about that any day. The parts in the past were interesting to read about as well. Overall; I found Midnight at the Electric to be a very interesting read! It was a quick, fascinating read that really draws you in, and keeps your flipping the pages for more. I’m even more curious to read more by Jodi now, and I’m hoping to get to the few I haven’t read of hers soon! Ooh! First review I've actually read for this book! Glad that you seemed to enjoy it a lot! I tend to really enjoy and relish in books that are told in multiple perspectives, or in this case, multiple time frames. Certainly sounds intriguing. Thanks for the review!